Music was always an integral part of Barb and Don Krieger's lives. Three years after they were married, they decided Don should take advantage of the GI Bill and obtain a music degree from Azusa College, where Barb had studied. He directed choirs, wrote music, and sang in male quartets. Both were in the concert choir at Azusa College and sang in quartets for many years. Before moving to Oregon, they sang in a 100-voice choir at Lake Avenue Church for 10 years. Barb remains involved at Mount Miguel Covenant Village in Spring Valley, California-the place she now calls home. 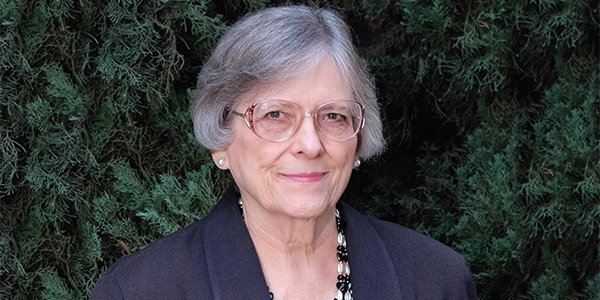 Barb's career included secretarial, bookkeeping, and administrative duties at a number of institutions, with 23 years at the Pacific Southwest Conference of The Evangelical Covenant Church. Since the early 1960s, the Kriegers have been connected to APU in many ways: faithful in attending Dinner Rally and musical and drama events, taking APU cross-country tours, contributing homemade crafts for APU's silent auctions, and developing long-lasting friendships on campus. Barb was very involved with students in APU's Heart to Heart Program and even had students living in their home for periods as long as a year. She still keeps in touch with these students who have gone into Christian work. Her life's Bible verse of Psalm 32:8 became a living reality as she mentored these students: "I will instruct you and teach you in the way which you should go; I will guide you with my eye." When Don knew in 2008 he was dying, it was his desire to set up a Don and Barb Krieger Endowment Fund. Barb agreed, and believed this would be the best way to keep their passionate love for music alive and uphold APU's motto of God First. The fund provides scholarships for students in APU's School of Music. Barb is also quick to share that her additional investments in gift annuities with APU have outstanding benefits. These include high interest rates, fixed income for life, and partial tax-free income. The remaining funds from her gift annuities will go into the endowment and help young men and women receive a Christian education. "Our APU investments are the best because they are investments for eternity," she said.